In a world now flooded with images it is difficult not to become blasé about photography and quite possibly the medium of reportage photography in particular. How many of us really feel the sense of anger and revulsion when scenes of bombed out towns in Syria with its infants dying on makeshift beds are shown on a twenty-four hour news loop? Not many one would suspect. The job of any competent photojournalist is to capture a moment, however difficult for the photographer and the subject matter and present that situation in as compelling a manner as possible. Some instances require little skill, the sheer weight of the subject matter negates any issues of composure, f-stop or white balance, the photographer’s job is already done. The tragedy tells its own story. But the real skill lies in capturing the unspoken, the image which stops the reader from turning the page and pausing for thought. This image from World War Two is a lesson in photojournalism. Here we see an elderly man returning to the remnants of his house which has been destroyed by a German V-1 attack whilst he walked his dog. 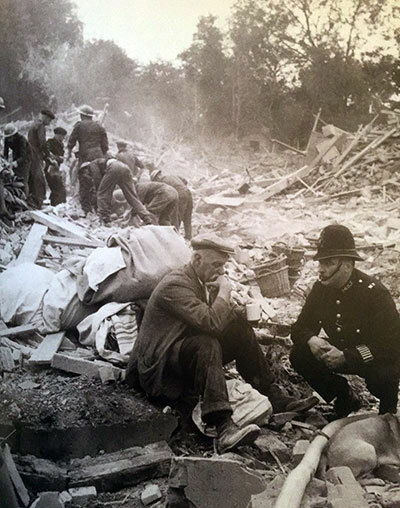 The policeman crouching beside him, listening as the man remembers his wife who has been buried deep beneath the rubble. A life, a marriage, a wife and a mother wiped out in a moment. The older I get the more I am affected by the memories of the forgotten, those who asked for none of this yet paid a price beyond their leaders comprehension. It makes one think again before turning the page or clicking ‘next’, these scenes, no matter how many, deserve a moment of our reflection if nothing else.